I've been trying for two days to upload photos into my previous post, but no luck. The dang thing (as in, BLOGGER!) seems to be broken. So here's a test -- and my opportunity to post a completely random photos. Or not. By the way, that's Mt. 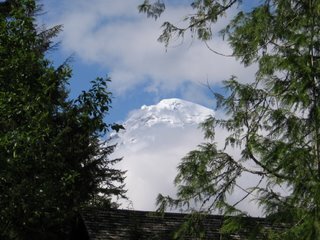 Rainier finally peeking out of the clouds just as we were leaving the park a few weeks ago. Even at Paradise Lodge we couldn't see anything but clouds. Grrrr!